This is a new exiting product!Never struggle with choosing the right timing; never forget to set the advance handle bar driving high speed (fully advance) and run the engine hot. Never forget to adjust the timing when stopping for a traffic light. This electronic advance system sets it for you! Automatically. It offers 9 advance curves to choose from. Five curves with an more aggressive setting in the lower part of the curve. And four curves offering a less aggressive setting. It is up to you.On top of that it has a unique feature for kickstarters: You can set the ignition moment for kickstarting yourself by choosing the best fire moment for your engine! You can choose from 10, 15 or 20 degrees by turning the turnable top of the rotor. Although not critical, two indicator LEDs help you with checking the kickstart moment you chose.Ignition timing is calculated BEFORE the first kick, so the bike will start at once. It is not necessary to turn the flywheel full 2 rounds before the computer knows the timing. THIS IS UNIQUE! All units mount easily on original or aftermarket baseplates. For 1936 to 1947 models you can also choose for complete kits. This kickstart moment is independent from the timing moment. This feature solves the problem of difficult starting, especially for models that use mechanical weights for the advance system. They are set on late (retard) and make starting very difficult. The LED closest to the switch is used for timing when the engine is not running. The LED indicator turns off (points open) indicating the exact timing moment. While the engine runs, the green LED and the red LED tells you what the kickstart setting is you chose. 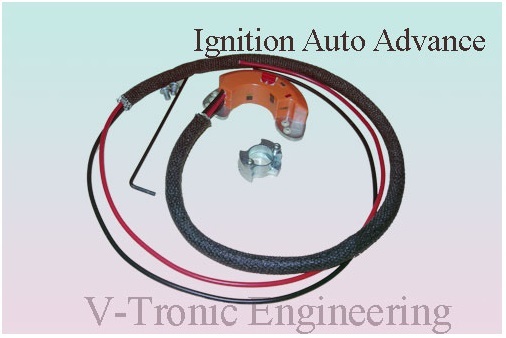 Ignition coil charge time: this is controlled by the software. No long dwell times any more. 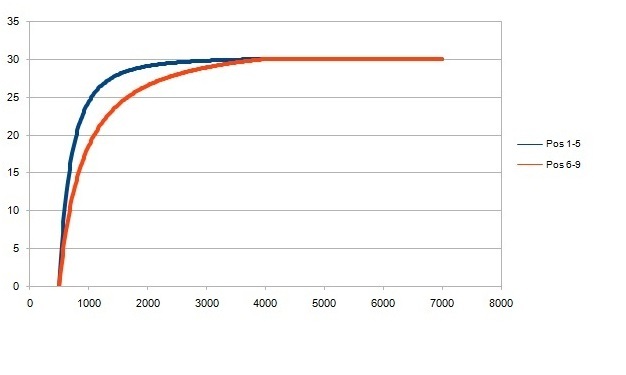 In a normal system using points, the dwell time is very long; especially with low RPM. This uses a lot of amps from the battery and heats the coil unnecessary. The software calculates when to start charging the coil before it has to fire. Every engine stroke again. This way no power is wasted and this results in a cooler coil and offloads the battery. Tunable top to chose your best kickstart moment; this is non critical. The engine will run on several settings. Don’t worry. Engine starts on kickstart moment and runs about 10 seconds at the kickstart setting before it sets to full retard (late). Coil charging moment is calculated for optimal charging time. Acceleration and deceleration is measured using two separate memory positions for accurate timing calculations. Front and rear cylinder data is kept for accurate timing. Automatic coil current shut off after three seconds idle. This prevents the coil from overheating and saves the battery. 9 advance curves to chose from. Timing is easy: identical to points timing. Switch setting “0” is used for carburator adjustment. The ignition is set to full advance at any RPM at this setting (don’t forget to set the switch back to 1-9 after finishing)! Note: Please download the new installation instructions for this product as the one included in the kit might have errors.